My first bullet train ride was from Osaka to Tokyo 14 years ago and it was one of my most memorable experience from all of my Japan trip. So when I started planning our Taiwan itinerary, I made it a point to include a ride to HSR (High Speed Rail) Taiwan’s version of Japan’s Shinkansen. Taiwan High Speed Rail (THSR or commonly known as HSR) is a high speed rail that runs along the western coast of Taiwan, from Taipei in the north to Zuoying (Kaohsiung) in the south. 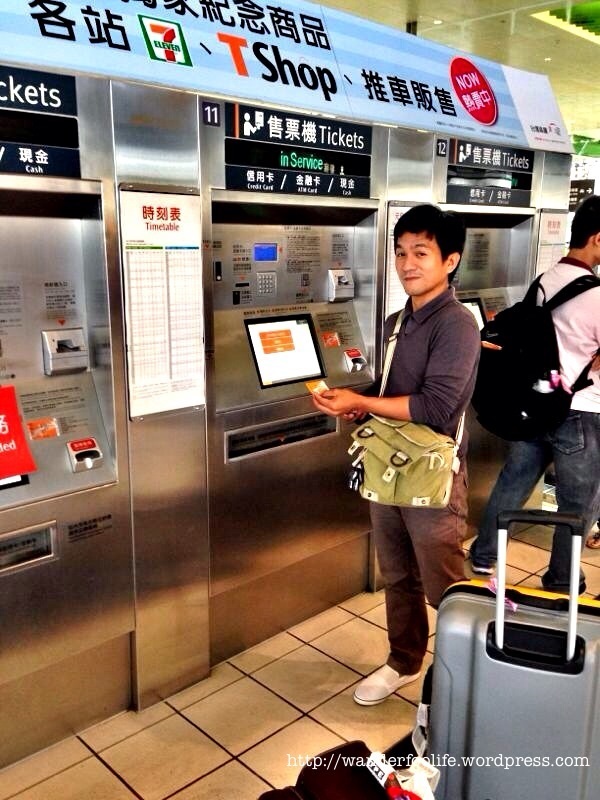 With a total of 8 stations, you can reached Zuoying from Taipei in as little as 96 minutes for the 345 km track. Taiwan HSR has a total of 8 stations ( Taipei, Banqiao, Taoyuan, Hsinshu, Taichung, Chiayi, Tainan and Zuoying). The stations are fairly new since HSR only started its operation in 2007, there are ample signage in english so it is a welcome relief for non-chinese tourists. Outside Chiayi HSR Station, there is a free shuttle bus if you are a HSR ticket holder which will take you to Chiayi Train Station in Chiayi town proper. 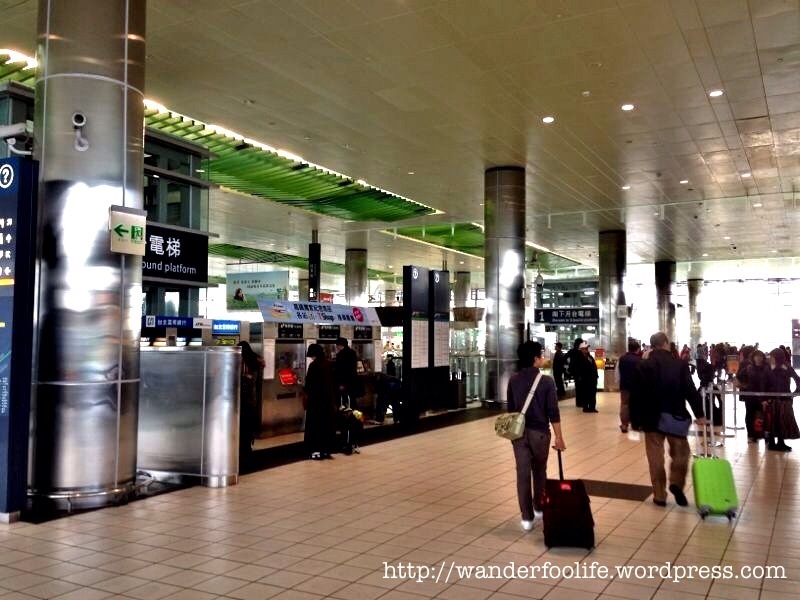 The Taipei Railway Station has become Taipei Main Station when Taipei Metro and High Speed Rail started its operation. 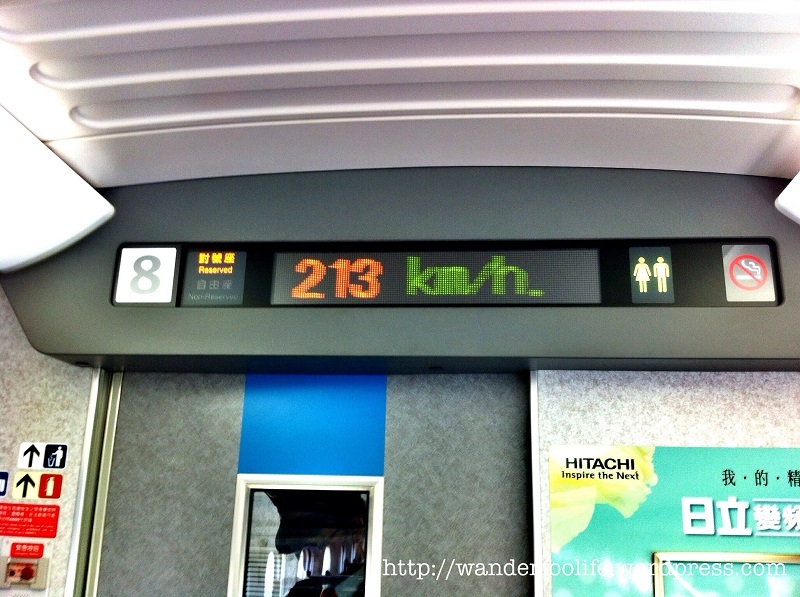 The train is a shinkansen technology from Japan, the first to be used outside the country. 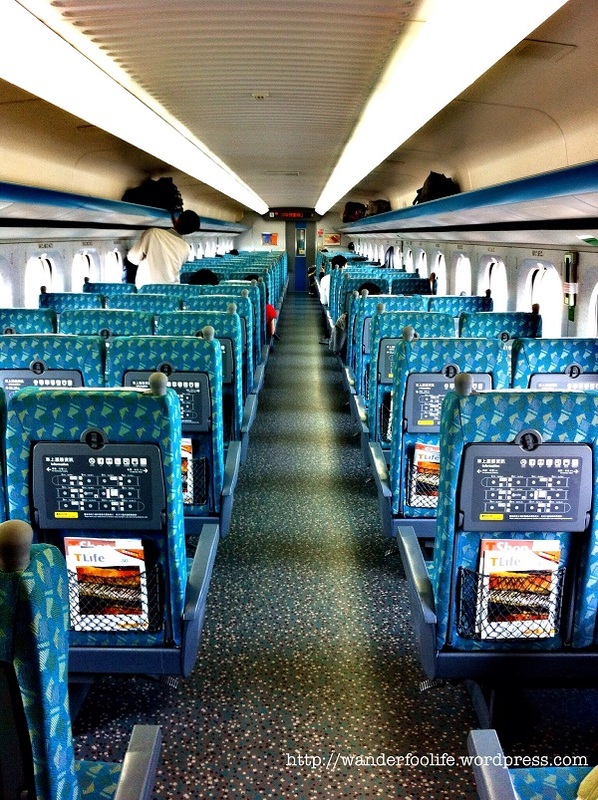 It is very spacious inside as compared to a normal train, and seats can be turned on the other way around if the train in traveling back to the opposite direction. Cars 1 to 9 are for reserved tickets holder (your car and seat number will be indicated in your ticket) while cars 10 to 12 are for non-reserved ticket holders where you are free to choose which availble seat you want to seat in. Light snacks are being sold inside the train just like in Japan. You can either enjoy the scenery from outside the window or comfotably sleep and enjoy the “speed”. 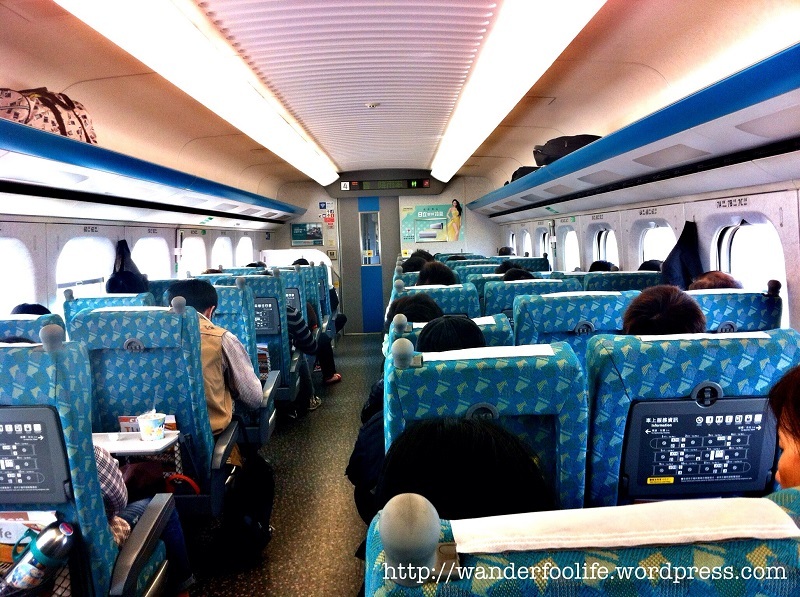 How much does it costs to ride on Taiwan HSR Train? From Taipei to Zuoying it costs NT$1,580 for a non-reserved car while it costs NT$1,630 if you choose the reserve seats. Discounts of up to 50% are being given to senior citizens, children and disabled, HSR official website also offer discounts if you buy/book the tickets in advance. 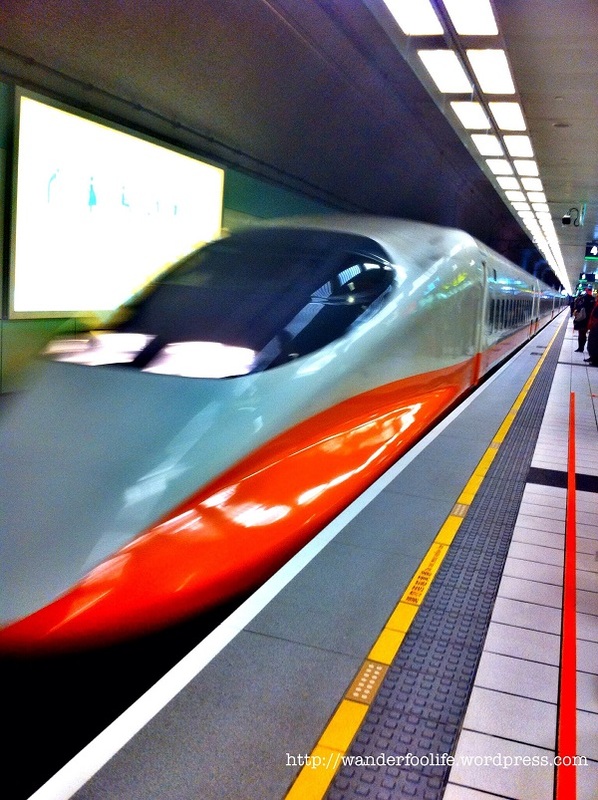 Where to buy Taiwan HSR Tickets? There are several ways to purchase HSR tickets. Inside the stations, there are ticket vending machines with english language instructions and there are the usual counters where you can queue and buy directly from the station staff. They can also be bought from 711, Family Mart and other convenience stores nationwide. You can also buy them online from THSR’s Booking System, advance bookings can be purchased as early as 28 days from your preferred date. Your ticket indicates the date of your travel, the train car number you need to take, the from which station to which station, the time schedule of your train and car number and seat number if you purchased the reserved seating. You can also buy advance tickets for your future journey, just make sure not to loose it, and if ever you want to take an earlier time of the train schedule that you bought, you can approach the train staff and ask for an earlier time, but you will have to pay an additional admin charge.